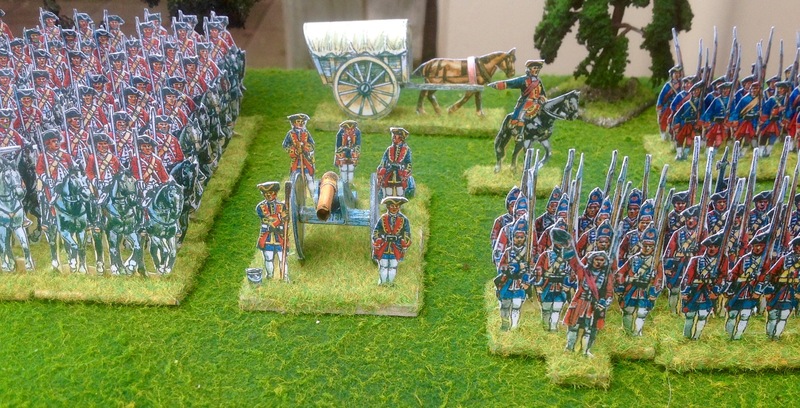 I’ve finally finished enough of the Paperboys figures to set up both sides to recreate a battle of the Jacobite Rebellion of 1745/6 – often simply referred to as ‘The 45’. Today I took advantage of the nice weather to set them up outside for a photo-shoot. I’ve reviewed these 28mm Paperboys figures previously. As units, they certainly look good. But I couldn’t wait to see how they would appear en masse on the table. Here’s the battle-field from the Jacobite side (click on these pics to see them full-size). 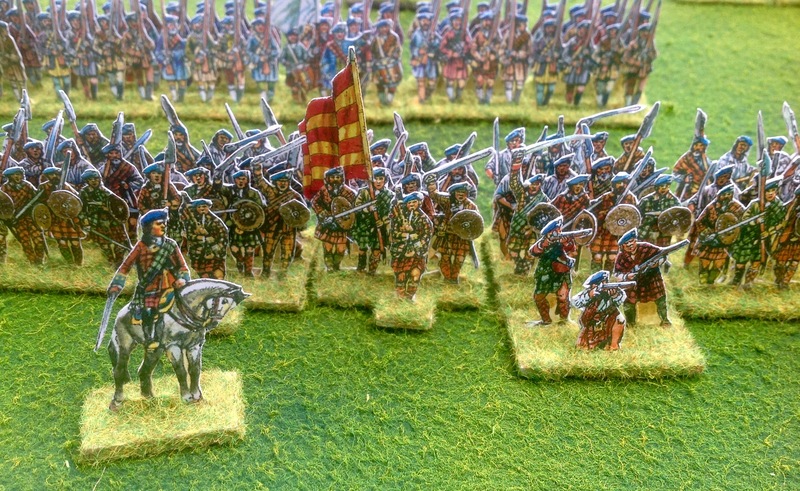 I have seven units of infantry so far for the Jacobite army, plus some cavalry and artillery. From this angle, you’d be hard-put to tell that these figures (apart from a couple of exceptions) are all flats! And here we see how the table looks from the Government side. 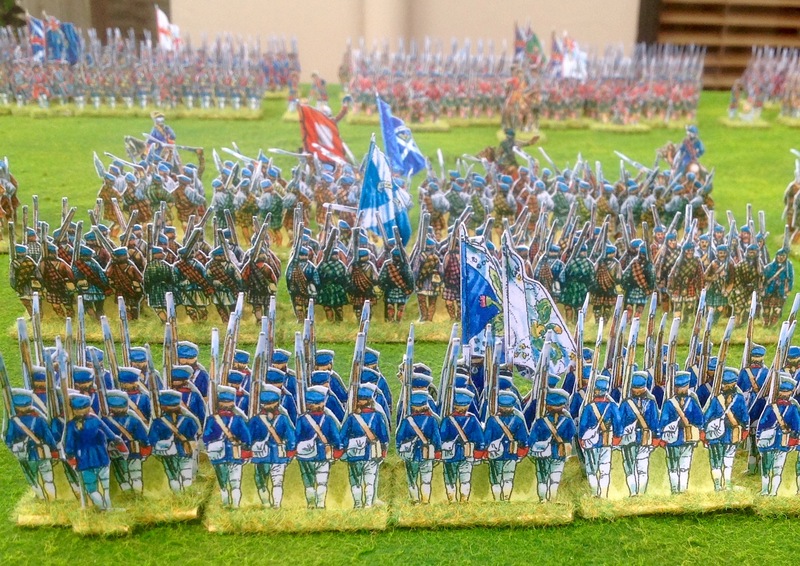 I’ve got six infantry battalions, a large unit of dragoons, and accompanying artillery. The commander of the Government troops is Prince William Augustus, Duke of Cumberland. He is best remembered for his role in putting down the Jacobite Rebellion at the Battle of Culloden in April 1746. Behind him are Loudon’s Highlanders – the Jacobite Rebellion had Scots on both sides. John Campbell, 4th Earl of Loudoun raised this regiment in Inverness and Perth in August 1745. Here’s the first paper battalion I had ever tried making. The beauty of paper figures is that, with careful cutting, even your very first attempt comes out looking perfect! 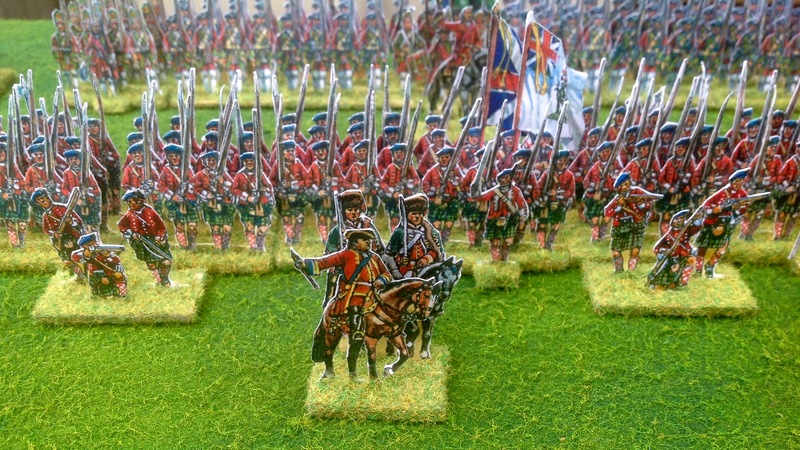 The blue breeches, instead of red, indicate that this unit is from a Royal regiment. Behind them is a provincial unit. Most of the provincial corps, such as the Yorkshire Blues, appear to have been dressed in blue rather than red coats. In the background is one of the few 3D models in the army – a small horse-drawn wagon. Well, the cart is 3D – the horse is still a flat! Here’s a unit in yellow facings. The only thing I’ve done to my paper figures that goes beyond what they’re supplied with is to add static grass to the bases. I’m really pleased how the unit of Government dragoons came out. They’re in an almost three-quarter view, which means you get to see more of the equipment and the horses. 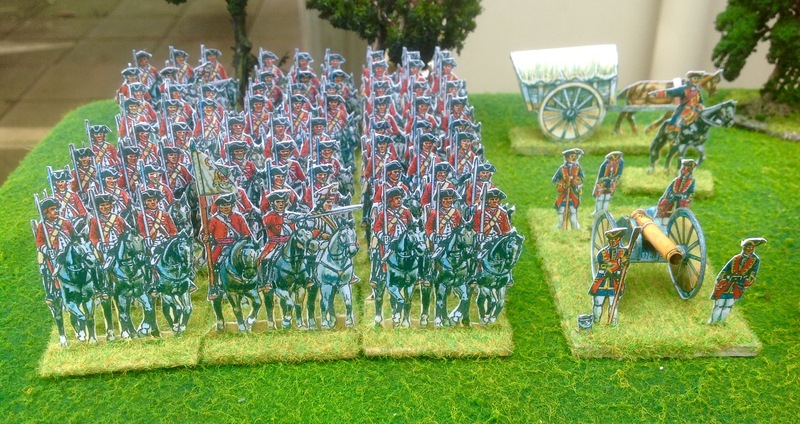 The Paperboys range includes cannons in both flat and 3D versions. I preferred the latter. Whilst fiddly to make, they look pretty good, considering they are cut out of paper! The gunners are still flats. 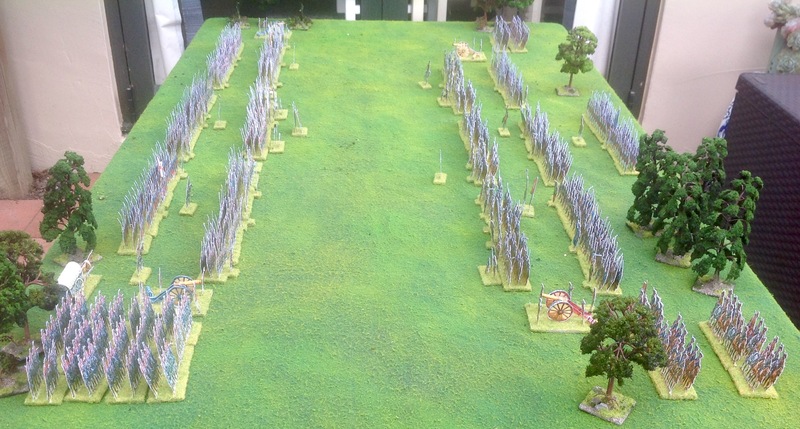 Another view of everything we’ve seen so far – cavalry, artillery, regulars, provincials, generals, even transport. The artillery also have a couple of small Coehorn mortars. Once again, the mortar is 3D, whilst the gunners are flats. Now to the Jacobites, charging forward waving claymores and other pointy weapons, and carrying small targes (shields). 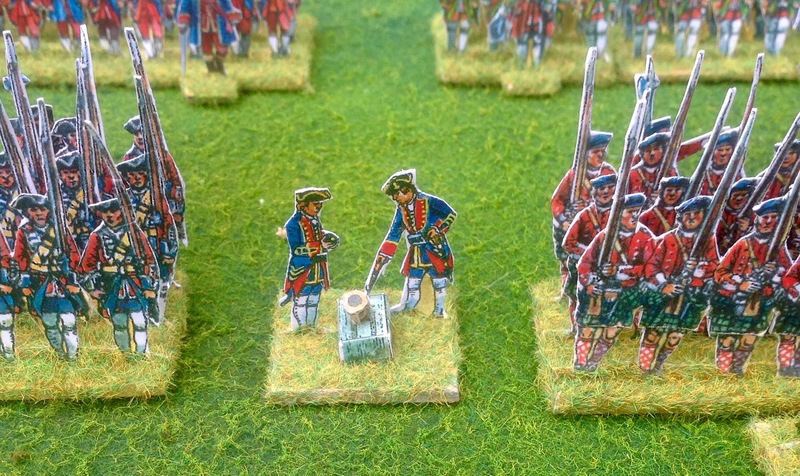 The assorted weaponry made these figures somewhat trickier to cut out than the muskets of the more regular units. But they certainly give a great impression of motion. Between the two units you can see Charles Edward Louis John Casimir Sylvester Severino Maria Stuart, more commonly known as ‘Bonnie Prince Charlie’, commander of the Jacobites. The red and yellow stripes of their flag indicates that this is a Clan Cameron regiment. On the left, you can also see a skirmisher base. 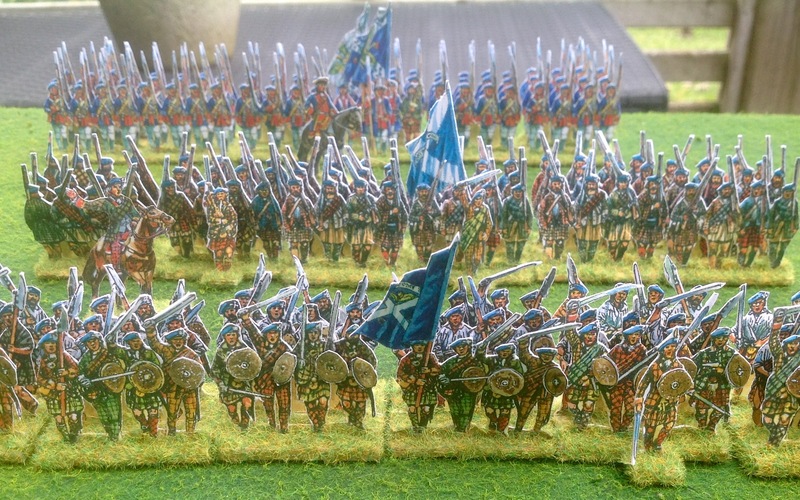 Another shot of wildly charging highlanders, these from Lord Ogilvy’s Forfarshire Regiment. Behind them you see another unit of highlanders who are carrying muskets. Highlanders generally discharged and then discarded their muskets, before charging forward with their traditional weaponry. The Jacobites also had artillery. This gun is served by several Jacobite gunners assisted by French artillerymen. 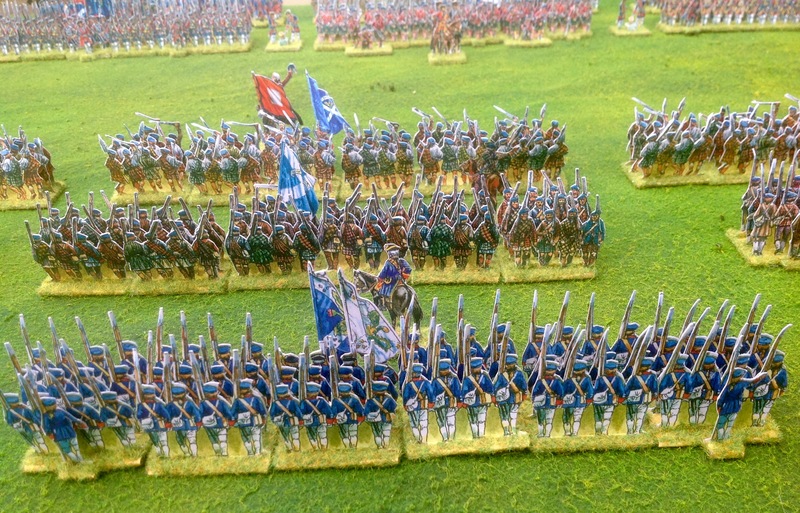 I’ve got one French regiment in my Jacobite army – the famous Royal Ecossais. Louis XV sent a small expeditionary force of about a 1,000 men to Scotland to help Charles Edward Stuart to try and recover his throne. This force was made up of the regiment Royal Ecossais, as well as a number of men from each of France’s Irish regiments, and the Fitzjames regiment of horse. By the way, did you notice the mistake in this photo? We’ve seen the front and back views, but what does a side view of flats look like? Well, despite the illusion of realism being broken, they still don’t look too bad in a symbolic sort of way. Better than wooden blocks or cardboard tokens, anyway! 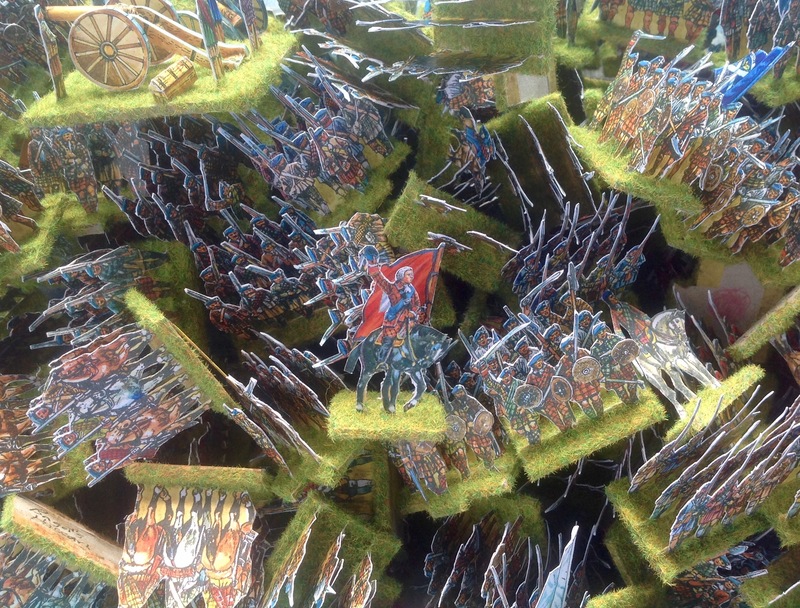 One of the beauties of paper soldiers is that they are remarkably robust. Here is my storage system! There’s certainly no risk of paint chipping. All that will be required before play is a little grooming with my fingers to straighten any bent muskets. Could this be an unintentional symbol of the outcomes of the Jacobite Rebellion?! Bonnie Prince Charlie stands atop a higgledy-piggledy pile of his troops! Previous Previous post: 28mm WW2 Dutch army completed at last! Very impressive – and gives a really good feel for the way those close-formation battles must have appeared at the time. Good stuff. Looks excellent. 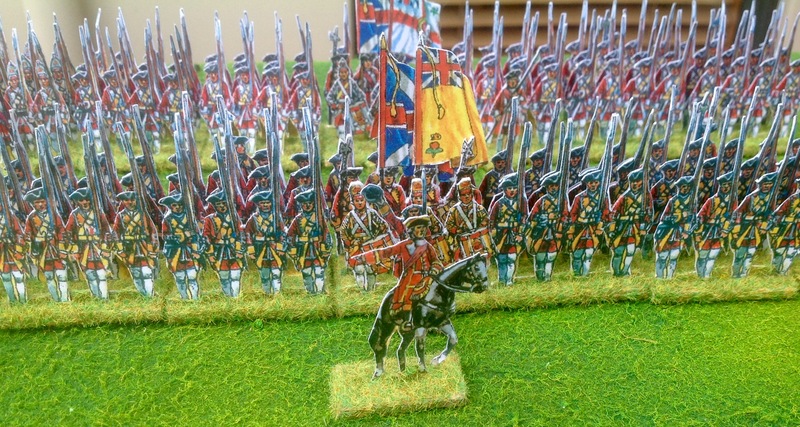 I’ve just finished working through the Government forces before making a start on the Jacobites. I haven’t gone for flocked bases but yours look really good. Glad to see you are enjoying the Paperboys. 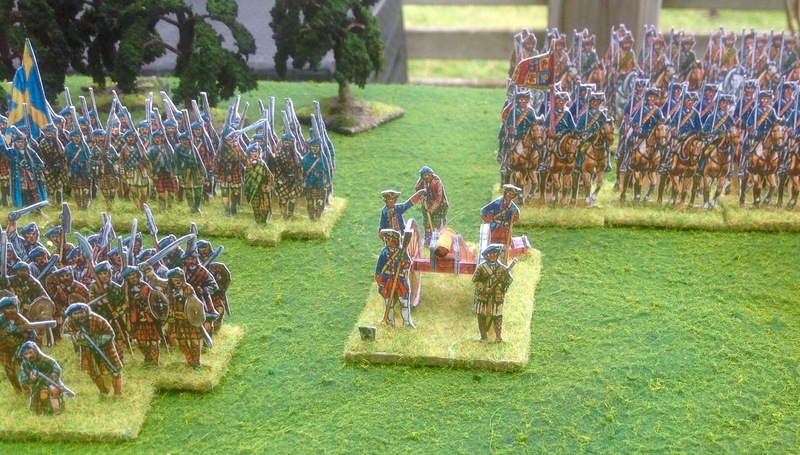 The Scottish Battlefield Trust is staging a paperboys one to one scale layout of the Battle of Prestonpans in September, so try to get a look at the photos. Oh, and visit the Paperboys Page on Facebook! These paper troops are really pretty cool Roly – thanks for bringing them to our attention! Fantastic! And thanks for the kind words on my blog. I’m now somewhat addicted to paper soldiers!! Brilliant idea to allow truly massed battles to be fought. Looks magnificent. They look terrific. As I now have 7 of the paperboys books, I really must find the time and energy to make some of them! It’s good to hear that it’s not as daunting as it might appear – therapeutic, even. 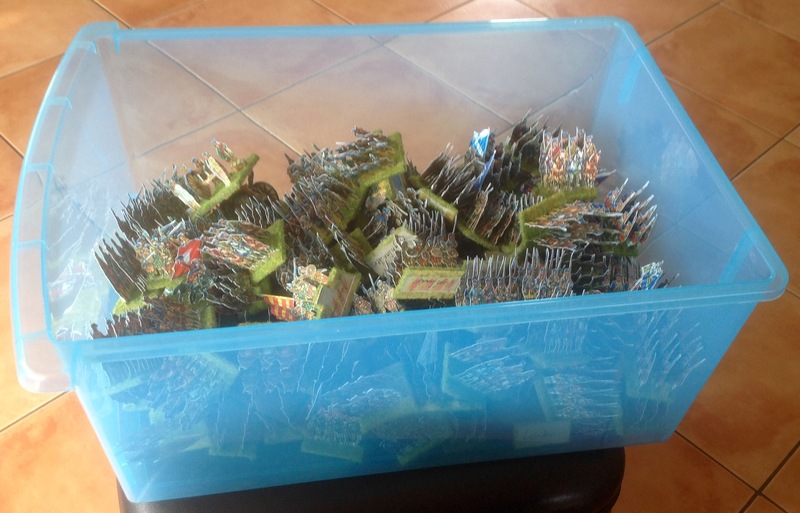 For me I think it will be enough to have paper armies – I never get round to painting metal or plastic figures, even though I have a fair number from years ago, such as entire ECW armies in 15mm which I’ve had unpainted since 1985. (And there’s the bonus that I can feel it’s environmentally more friendly just to use paper! ;-)) Thanks for the inspiration!